Many individuals are attracted to Network Marketing with the idea that they can simply approach their immediate network, sign them all up, and watch their bank account grow exponentially. For most people this is not the case and they realize that many, if not all, of their family and friends are just not interested. Those that make it pass this stage are then left wondering “what do I do now?” The answer is they have to learn marketing – they have to learn how to become a master prospector – and there are really two options. Active prospecting is when the business owner is the one who is seeking out prospects. Most new marketers start out doing active prospecting because there is little or no cost involved and they get a more immediate result. Examples of active prospecting includes sending out social media direct messages, calling leads, hosting home parties, connecting with people publicly and participating in networking groups. They are actively educating others on their opportunity with the intention to recruit them. Passive prospecting (also called “Passive Marketing” or “Attraction Marketing”) comes into play when marketers realize that their time is more valuable. This type of marketing involves prospects seeking them out because they were attracted by some valuable piece of content that they posted online. The reader or viewer is encouraged to take some type of action, such as fill out a form or comment on a social media post, and that person then becomes a lead. The focus is using tools, systems and automation that work on their behalf around the clock in order to create a pipeline of individuals reaching out to them on a consistent basis. Therefore, their time is primarily spent educating prospects who have already expressed an interest in what they have to offer. The challenge with passive prospecting is that there is usually a cost or investment required to set things up, and the results are not always immediate. Because these strategies are not readily taught inside of Network Marketing companies many marketers shy away from it and believe they don’t need to do it to become successful. For most seasoned and successful Network Marketers a combination of both active and passive prospecting is usually needed to either keep their pipeline full or keep their business growing. Initially, a new marketer has an untapped warm market, a resource of friends, family and acquaintances to help get them started. At this stage active prospecting is not necessary. However, instead of waiting until their warm market dries up, a recommended strategy would be to simultaneously produce content and set things up to be able to have prospects come in passively in the future. When done properly the new marketer can transition from prospects in their original warm market to new prospects who have entered their warm market through social media. So when should active prospecting be performed? Well, the other factor to consider is momentum which essentially is the active rapid growth of someone’s business through their warm market and the warm markets of their downline business partners. This is Network Marketing Utopia! When their business is in momentum and they have downline business partners who are keeping them busy then just like in the beginning active prospecting is not necessary. Active prospecting should only be performed when someone’s business is not in momentum and they are looking to get back into momentum as soon as possible. Consequently, most businesses are in this stage so the need for active prospecting is usually the norm and not the exception. What is the recommended platform for Active Prospecting? So if active prospecting is necessary for most Network Marketers then what is the recommended platform? Based on our discussion above, LinkedIn has to be the clear choice. We’ve indicated that active prospecting is often time consuming, and that is because most social media platforms are designed to keep their users entertained. So when someone is prospecting on a platform like Facebook they have to “warm up” their prospects because users are not on Facebook to discuss business. This, of course, takes precious time. LinkedIn, however, is a professional network where users are there to discuss opportunities. Therefore, time is saved by skipping the “chit-chat” and getting straight to business. Another reason why LinkedIn is the clear choice is because there is a higher caliber of professionals who have credibility, influence and a strong connected network. Again, momentum in Network Marketing occurs when someone is building warm market to warm market. The chances of obtaining or regaining momentum in one’s business is higher when a prospect is successfully recruited on LinkedIn who has a large, trusted warm market. LinkedIn also has one of the best searching platforms that allow networkers to find professionals who would be ideal for their business. Users on LinkedIn are more likely to have their profiles filled out because they are looking for opportunities and want to be contacted – and all of their information is public! 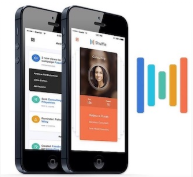 When LinkedIn’s robust searching platform and public user profiles are combined with the ability to message prospects in real time then, again, it becomes clear why this is the recommended platform for active prospecting. As discussed earlier, we recommend that passive prospecting strategies be established prior to running out of warm market prospects. Unfortunately, most Network Marketers are not educated on how to set things up or don’t take the time to learn how to do it properly. What typically happens is they became desperate when they realize they have no one to share their business with and start spamming their links all over social media hoping that someone will respond to their pitch. When no one responds they end up quitting. We’ve seen this situation all too often which is why we’ve created a free workshop that combines the best of Active Prospecting on LinkedIn with how to get started with Passive Prospecting. How to set up your LinkedIn profile to give yourself the greatest chance to connect and engage with new professionals. Discover the “unlimited leads” strategy which will afford you with an endless supply of high-quality targeted prospects for your business. Learn the secrets of automating parts of the prospecting process so you can start having prospects come to you passively. CLICK HERE to enroll for the free LinkedIn Workshop. Did this article on “Active vs Passive Prospecting in Network Marketing” help you? If so, then share your feedback in the comments section below. If LinkedIn is the largest professional business network then why aren’t there more people using it to build their home business? Think about your particular business for a second. Determine the value that your opportunity has to the marketplace. I can only assume that you are in business to make money, and in order to generate significant income you need to focus on growing a network of other like-minded individuals. So who are these individuals and how do you find them? 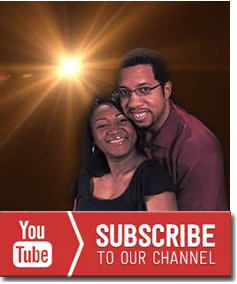 Watch the video below as we explore this topic together. 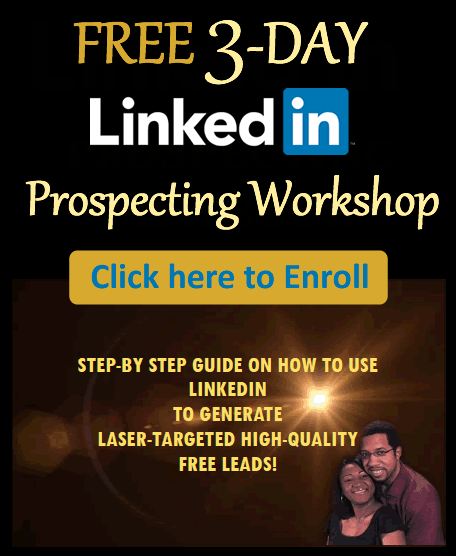 CLICK HERE to enroll for the Free 3-Day LinkedIn Prospecting Workshop. Did this article on “Why You Should Use LinkedIn for Home Business” help you? If so, then share your feedback in the comments section below. One of the questions that new marketers ask me often is “How do I get people to notice me online?” They have probably been posting information and links about their products, services and opportunity publicly on social media and have not been getting much engagement. Perhaps, they have sent private messages to friends with a special deal or promotion, but they get no response. In fact they keep repeating the same actions believing if they do more then eventually they will get results. Contrary to popular belief, not everyone on social media is in your target market. In fact, many individuals in your immediate network are not candidates for your products or services. They are just not going to be interested in what you are offering. And that’s ok! Think about what it is that you are selling. Ask yourself “Who would be my ideal customer, client or business partner?” If you are selling stake then are you going to have any engagement in a room full of vegetarians? Of course not. Therefore, it would be wise to find the room where the stake-lovers hang out. Once you have identified your target market then next you must determine their problems and points of pain. Think about what they want less of or even what they may want more of. 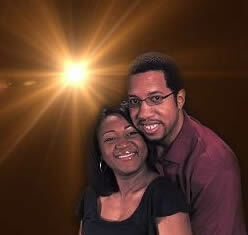 There is usually a need or a desire that is shared among all the individuals in this group. They are searching for something and are looking for a solution. For example, if your target market includes middle-aged people then they are probably looking for ways that they can retire comfortably. They are also looking for solutions to keep them looking and feeling younger. Now that you’ve identified your target market and what their points of pain are it is time to become a problem solver. If you’ve been correct up to this point then what you are offering IS the solution that they have been searching for! This is where the magic happens. People will start noticing you online when they feel that you are addressing their biggest needs, wants and desires. Understand that they don’t want a product, service or opportunity. They want relief from their pain and issues. If you take the time to speak THEIR language and get them to know and like you, then you become trustworthy and they will respond to you online. Did this article on “3 Ways to Get People to Notice You Online” help you? If so, then share your feedback in the comments section below.